With the advent of Web 2.0 technologies, social media and smart phones, schools are becoming increasingly reliant on wireless technology. School wireless networks need to have the capacity and coverage to support virtual learning environments, online content, streaming video, mobile devices and more. School wireless networks need to have stable and reliable connectivity in learning areas, making solutions available to students and educators alike. How many users can one wireless access point carry? What about dead spots inside the classroom? What if many users are connecting to one device, will other users eleswhere have the same wireless speed and connection? Will teachers have a reliable connection in learning areas? These are common concerns and questions for a school wireless network. SecurEdge Networks provides the wireless solution of Airtime Fairness. This ensures that everyone has the same experience no matter when they get on the network. Role Based access control also helps to guarantee bandwith. With our professional team of wireless network designers and engineers, your school wireless network will be designed to the best capacity and coverage it needs now and for the future as well. Deploying WLAN in the classroom provides an enormous benefit to students and educators alike, but one common concern is management by the IT Staff. Some small school IT departments do not have the technical knowledge or a large amount of time to invest in the wireless solutions. Another big IT Challenge involves security. SecurEdge Networks provides the wireless solution of Device Fingerprinting and 802.11x authentication recognition on any wireless device. This also gives the school IT staff the power to block or allow specific devices or users. With this information, the IT staff can also easily manage users on the school wireless network. SecurEdge Networks can help provide the wireless solution for your school network. We understand the unique challenges of education and can provide many solutions. 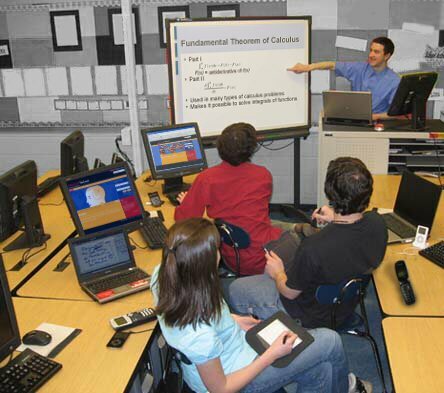 (WLAN) Wireless Networks for schools can provide an enormous benefit to the entire campus. Contact us today for a Free Consultation or Free Wireless Network Design for your (WLAN) Wireless Solution or download our free wireless network design kit. Previous Post: Wireless Network Management: What is slowing your wireless?